Between the versatile cameras, bloat-free software and rather good gaming performance, the phone will more than suffice for most prospective users. The Samsung Galaxy A50 does it all while offering a really good user experience. Last year if you told me Samsung would soon make some of the best mid-range smartphones, I would have laughed you off. Samsung’s mid-range J and A-series phones were utterly incompetent, with designs straight out of 2015. It took longer than expected, but the Chinese assault has finally had an effect. 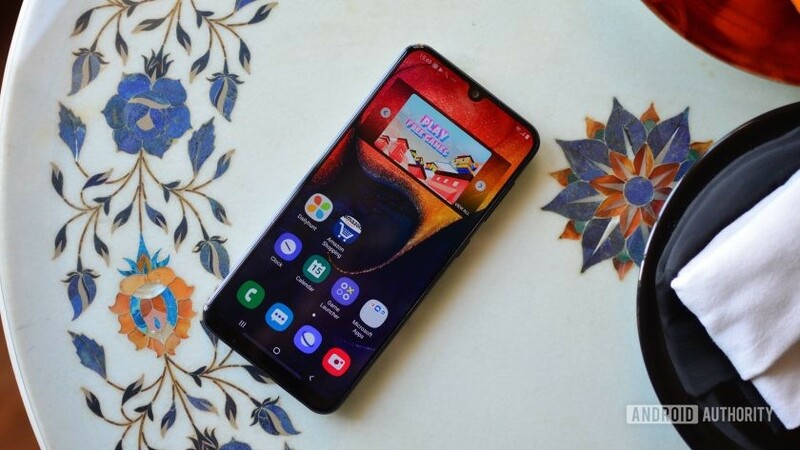 Samsung is now playing on the offensive and the Galaxy A50 is the best example of what happens when the company decides to get serious. Marking the top end of the A series (for now), the Galaxy A50 takes phones like the Redmi Note 7 Pro and Pocophone F1 head on. Follow along for our Samsung Galaxy A50 review to find out what we think about it. I worked on this Galaxy A50 review over the course of a week. My Samsung Galaxy A50 review unit with Samsung One UI on Android 9.0 was used in India on the Airtel network. The unit was running the March 1st, 2019 security patch and build number PPR1.180610.011.A505FDDU1ASC1. Samsung’s M and A series phones share a lot of design elements. The Galaxy M30 and A50 are particularly similar. There’s nothing inherently wrong with this, and Samsung made just enough changes across products to make them stand out. The Galaxy A50 picks up the gradient style of the M30 and gives it a rather attractive rainbow-like sheen. The phone looks great and will definitely turn heads. Samsung opted to use plastic all around, which helps keep the weight of the phone down to a sprightly 166 grams. The downside, of course, is that the phone is a fingerprint and scuff magnet. The phone will definitely pick up scratches over time and you’ll be well served by a quality case. The weight reduction combined with excellent ergonomics makes the Galaxy A50 comfortable to hold. The back panel smoothly flows and curves around the edges ensuring there are no hard edges hurting your palm. The central frame is made of metal and has the volume rocker and power button on the right. On the left is a tray with dual nano-SIM card slots as well as a dedicated microSD card slot. Along the bottom edge of the phone is a 3.5mm headphone jack, USB-C port as well as the speaker grille. Talking about the speaker, volume levels here are significantly better than on the M30 and the audio reproduction is much fuller sounding. Despite a definite focus on the higher frequencies, there’s just a hint of bass too and you can safely crank up the volume if you wish to. You might have noticed the lack of a fingerprint reader at the back. That’s because the Galaxy A50 employs an optical in-display fingerprint scanner. It works fine, but definitely isn’t as fast as a standard capacitive fingerprint reader. The in-display scanner takes just over a second to recognize your biometrics and let you into your phone. Personally, I found the face unlock option faster, but it definitely isn’t as safe. The front of the phone resembles the Galaxy M30 quite a bit. The Samsung Galaxy A50’s Infinity-U waterdrop notch juts into the 6.4-inch Super AMOLED display. Bezels at the sides and top are as slim as they get in this category but the design is marred by the rather big chin at the bottom. Overall screen-to-body ratio is a very respectable 85.2 percent. The Samsung Galaxy A50 has a 4,000mAh battery which is a step down from the larger 5,000mAh unit on the Galaxy M30. Regardless, the phone still comfortably lasts a full day of use and has a decent amount of charge left over. During my week of use, I consistently had 30-40 percent charge left over at the end of the day despite long calls, extensive social media use as well music streaming. The 6.4 inch Super AMOLED Full HD+ display on the Galaxy A50 is definitely one of the highlights of the phone. It looks absolutely fantastic and makes watching multimedia content a pleasurable experience. With support for the Widevine L1 DRM, the phone is capable of streaming HD content from Netflix. The Super AMOLED display on the Galaxy A50 is fantastic to look at. The screen is vibrant to the point of appearing ever so slightly oversaturated. There are options within the settings menu to tweak this to your taste. Being a Super AMOLED display, black levels are sufficiently deep too. Viewing angles on the Galaxy A50 are great and the phone works outdoors comfortably. The screen brightness more than compensates for direct sunlight. The phone comes with an option to toggle on the always-on display mode for notifications which is great since there is no dedicated notification LED here. The Galaxy A50 is powered by the Exynos 9610 chipset, which hasn’t been seen on any Galaxy phone yet. Built on a 10nm fabrication process, the chipset uses an octa-core big.LITTLE architecture. The four Cortex A73 cores clocked at 2.3GHz are powerful enough for almost anything you throw at the phone while the four Cortex A53 efficiency cores clocked at 1.6GHz ensure that the phone sips power when not performing an intensive activity. There’s a Mali G72 MP3 GPU handling the graphics end of the business. The phone ships with 4GB or 6GB of RAM depending on the variant you opt for. Both variants have 64GB of storage which is definitely a bit odd. The Samsung Galaxy A50’s battery performance is right in line with what you would expect from a phone with a 4,000mAh battery. The phone lasts a full of day with moderate use and has enough charge left over to last half of the next day too. Even with heavy gaming use, the phone sips power and you should be able to get a full day of use easily. In our testing with a mixed-use case of gaming, social media use and music streaming, the phone consistently managed over six hours of screen on time. The phone supports 15-watt fast charging. Network performance was exemplary on the Galaxy A50 and the phone managed to hold a signal even in a low network environment. Calls sounded loud and clear at both ends. The Exynos 9610 ensures that day-to-day usability is top notch on the Galaxy A50. Be it navigation around the interface, animations, gestures or just about any app you throw at the phone, it maintains a steady clip. Samsung did an amazing job optimizing the software for the hardware and using the phone feels great. Out of the box, the interface’s animations are a bit overbearing, but turning them off is easy (and highly recommended). The GPU section is powered by a Mali G72 MP3 which we found satisfactory. The most obvious test was to put it through the most popular smartphone game around. The phone maintains a steady frame rate in PUBG with the settings at Ultra mode. I noticed no slowdowns, the draw distance was great. The phone got just moderately warm even with extended gaming. Without a doubt, the Galaxy A50 offers one of the best PUBG experiences in this category of phones. We put the phone through a few benchmarks. Unlike the Galaxy M series smartphones, the Galaxy A50 runs Android Pie out of the box. Not just that, the phone has a One UI-based interface which is almost exactly the same as what you get on the Galaxy S10 as well. The software is straightforward and easy to use, with oodles of options to tweak it to your preference. From options for displaying content on the always on display to turning off animations altogether, you can also switch between button and gesture-based navigation. Should you choose to, there is an option to wake Bixby using the power button. During initial set up, the phone lets you install a wide range of Samsung apps, which is a much better way of onboarding users than bloating up the phone’s software. However, while the Galaxy A50 doesn’t really come preloaded with a lot of apps, it doesn’t mean it’s completely guilt free. The My Galaxy app pushes quite a few notifications daily. Apps like Daily Hunt and the Microsoft app suite cannot be uninstalled. Samsung stepped up its game as far as cameras are concerned. I’m particularly enthused over the use of wide-angle lenses since they allow for much more versatility with photography. The camera arrangement on the Galaxy A50 uses a combination of a 25MP primary camera combined with an 8MP wide-angle lens as well as a 5MP depth sensor. The front facing camera also has a 25MP sensor. The cameras on the Samsung Galaxy A50 are quite good for social media junkies. As long as there is good light out, the cameras can capture some great-looking shots. The primary camera has a tendency to overexpose, because of which the scene can appear brighter than it is. A quick toggle switch lets you move to the wide-angle lens. You can notice the difference in exposure between the two shots. You definitely do not want to be pixel-peeping with the photos on the Galaxy A50. In a bid to reduce noise, Samsung has very aggressive algorithms going on that completely destroy low-level details and give images an almost watercolor-like effect. On the flip side, if all you do is look at images on your phone’s display, photos will look perfectly fine and ready to share on your preferred social platform. Like most mid-range phones, low-light image quality is where things take a serious hit. Both in the standard and wide-angle modes, images have an incredible amount of noise and look very soft. The 25MP front-facing camera produces images that look good on screen but are once again short on low-level details. Compared to the Redmi Note 7 Pro and its pixel-binning-capable 48MP camera, the Samsung Galaxy A50 doesn’t do as well but it is still a versatile performer that can get good-looking shots as long as there is sufficient light. Follow through here to view full resolution Samsung Galaxy A50 image samples. The Samsung Galaxy A50 is available in two variants with the only difference between them being the amount of RAM onboard. The 4GB RAM variant is priced at 19,990 rupees (~$281) while the 6GB RAM version is available for 22,990 rupees (~$323). Storage on both variants is the same at 64GB, a move that is quite perplexing. The devices are on sale now over at Flipkart, Samsung’s own online store as well as at offline stores. Samsung has seemingly flooded the market with a whole range of phones stretching from the entry-level to upper-mid range segment. The phones progressively add on features but the common thread between them has to be the focus on user experience. And that’s really what the Galaxy A50 is all about. The Samsung Galaxy A50 is all about a quality user experience. In India, there are two main competitors to the Samsung Galaxy A50. Unsurprisingly, both phones are from Xiaomi. At the more affordable end is the Redmi Note 7 Pro, which delivers exceptional value for money and one of the best cameras in the segment. However, its software just has too many bugs and issues. On the other hand, the Pocophone F1 offers all the essential flagship features, distilled down to an upper-midrange price bracket. For anyone looking for exceptional performance, the Snapdragon 845 toting Pocophone F1 is an easy recommendation. However, the phone is built to a cost and it shows in features like the display. The Galaxy A50 has a significantly better Super AMOLED display and a nicer design. Performance-wise too, the Samsung Galaxy A50 is more than capable of holding its own with popular games like PUBG. This is one of the best mid-rangers Samsung has produced in years and I would have no qualms recommending it to all but the most demanding users. What do you value more — A strong user experience or all-out hardware performance? Let us know in the comments!